Hello, and welcome to this training event. How can your shop become the best choice for customers? We would ask you to take a look around this supermarket and then tell us how you would maximize the father’s day sales. Please put on your Virtual Reality display now. Don’t use the VRmaster while walking, cycling or driving a vehicle. VRmaster gives an intense experience that can cause dizziness or disturb your balance. Sound futuristic? It’s not; virtual reality has already found its way into commercial training programs. VR is back, and maybe this time we’re all going to use it. How do companies get in on it? The idea of virtual reality is, of course, not new. There was a surge of interest in the nineties, which started to fizzle out in later years. Possibly the cost of virtual reality units – which meant that consumers could not realistically purchase them for use at home – was a reason for this decline in popularity. Keeping in mind the hefty price tag of $60,000 for the stand-up and $55,000 for the sit-down version I think you’ll agree that you probably won’t be playing this incredible system at home, you’ll be most likely playing it at the arcade. The video also shows that perhaps technology wasn’t quite ready for the immersive experience virtual reality offers. Now, with Oculus Rift set for early 2016 and Samsung, Sony and Microsoft (among others) following suit, virtual reality glasses are soon within consumer reach. Going at roughly €200,- a pair, technology enthusiasts can purchase one without having to think too long about it. But €200,- may mean the chances are small that virtual reality will play a large part in education. Most schools and companies will be reluctant or unable to pay that much for the glasses alone, and then pay the added cost of producing virtual reality material. This is where Google steps in. 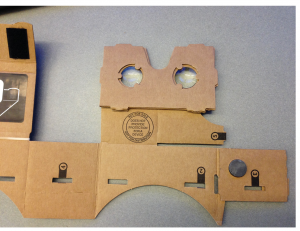 You can already buy a pair of Google Cardboard goggles for €12,95. If this is still too pricey, there’s no need to worry: Google provides an example how you can make the VR goggles from scratch, entirely for free. Google Cardboard can be used with any smartphone, and there are plenty of apps already available to make it worth your while. But why would we want to use virtual reality for education? Certainly everyone can see the benefits for training pilots and military personnel using Built Environment Education. But what are the advantages for training teachers, line chefs or supermarket employees? According to Psotka, virtual reality “can be used for exploration and for training practical skills, technical skills, operations, maintenance and academic concerns” (Psotka, 428). But a reason for choosing virtual reality over personal training is given by Keenaghan and Horváth: “VR offers optimal utilization of resources and assets”(2). When a large and spread-out group of employees needs training, an easy way to dispense expertise is online. The best way to offer a memorable and immersive experience is through virtual reality. VR is an interactive technology, which provides students with the opportunity to learn by doing and lends itself to student centred, rather than teacher centred learning. Perhaps the next step will be Immersive VR as envisioned in 1995, where “simulated objects appear solid (…) much like real objects in the real world. They can be picked up, examined from all sides, navigated around, heard, smelled, touched, hefted and explored in many sensory ways” (Psotka, 406). This would help the introduction of VR in the workplace, and would in many cases be an intuitive development. This is an important difference with real-life events. While there are always opportunities to join discussions at regular, real-world training events, more often than not will you only encounter employees that work in stores close to yours. Virtual reality gives a person working in Amsterdam the chance to follow training programs and swap ideas with someone from anywhere in the world. The cheapness of the material and the new possibilities in education make it very likely that this virtual reality event is only the first of many. ArchiVision. Dutch TV Host Matthijs van Nieuwkerk Tries out Oculus Rift. N.p. Film. Joey Lapetina. Virtuality. N.p. Film. Keenaghan, Garrett, and Imre Horváth. “State of the Art of Using Virtual Reality Technologies in Built Environment Education.” Conference papers (2014): n. pag. Web. Psotka, Joseph. 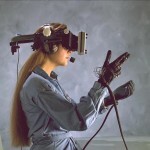 “Immersive Training Systems: Virtual Reality and Education and Training.” Instructional Science 23.5-6 (1995): 405–431. link.springer.com. Web. “Welke Virtual Reality-Brillen Zijn Er Allemaal?” N.p., n.d. Web. 13 Sept. 2015.